Sometimes things happen that you think you’ll never be able to live down. We had breakfast in the hotel’s coffee shop. Gary wanted to fool around afterwards. He said he was horny, we had the room till 11, it would take my mind off worrying, and, why not? They were all really good arguments, and I was horny too, but I said no. So we rented suits and swam for an hour. I swam as vigorously as I could, trying to work off my building nervousness, then got out, showered, dressed, and we called a cab. We got home at ten after ten. My mother’s crap car was in the driveway. My heart started racing. “Come on, let’s get the show on the road,” Gary grunted, and paid the driver. I hesitated, and he grabbed my arm; we walked to the house and went in. My mother was sitting in the living room, talking to the Jenks. “Keith,” she said when I came in. He voice was flat, unemotional. She didn’t get up. I walked over to her, expecting her to stand up and hug me, but as she just sat there looking at me, I wasn’t sure what to do. After a moment, I turned and sat down in one of the chairs there. “I guess I’ve been growing some,” I replied. Just like that. She was going to tear up my life without giving it a second thought. I looked at Mr. Jenks. I’d tried. If anything different from what she was asking was going to happen, it would be because of him now, not me. “What’s this?” she asked, opening it. I was sitting in a courtroom. This wasn’t a regular trial or anything like that. It was a hearing, and it was about me. Go figure. Mr. Jenks had spoken to his attorneys, and they said that if my mother wouldn’t allow me to be adopted, the only other options were to have her declared an unfit mother and me made a ward of the court, or for me to be emancipated. Now that I had a proxy mother to compare her to, I could accept the fact that my own certainly was unfit, but Mr. Jenks said my opinion and the legal definition were a little different, and the chances of having her declared unfit were pretty small. That left emancipation. Which we were trying to achieve at the hearing. Gary was with us too, and Mrs. Jenks. There weren’t any lawyers present, other than my mother. The judge spoke once the bailiff had us all seated in a semicircle, facing him. “This is a hearing on a petition from Keith Rogers Perryman, a minor, on the issue of his emancipation. Is there anyone present who would oppose a decision for the petitioner? My mother sat down. The court stenographer finished typing and sat with her fingers poised, ready for more. “Yes, you honor,” I said shakily, shrinking back into my seat, thoroughly intimidated. What was I doing here? And then I remembered. I was here because I wanted to be here. What happened here today meant everything to me. And I’d better stand up for myself now! Circumstances had brought me to this. If there was anything I could to do make it all end up as I wanted it to, it was up to me to do it. I sat up straighter in my chair. The judge smiled and told the stenographer to note my remarks. It appeared to me she already had. The rest of us were asked the same questions, even Gary, and they all said no. I figured my mother might say yes, and so did she, but when the judge said I would be held in the court’s jurisdiction as a ward of the court during whatever delay she was granted, she got red in the face and said she’d represent herself then and no continuance was necessary. The minor petitioning the court has to be at least 14. The minor must be willingly living apart from his/her parents or legal guardians with their consent. The minor must be handing his/her own financial affairs. The minor must provide a statement of income and expenses, and show their ability to continue to meet expenses without parental help. The minor’s financial well-being must come from income or resources that are legal in California. The judge asked me to tell him about my situation with regard to each of these four points. I’d spoken to Mr. Jenks about this; we’d gone over each one of the items in detail. He’d decided, and I’d unhappily been convinced, that it would be more impressive and show my maturity if I answered the judge’s questions and did all the talking on my own behalf. I hadn’t done it all myself, the prep work I mean. Forms had had to be filled out, some financial documents prepared, and I’d been coached on what to say. Mr. Jenks had had one of his lawyers come to the house to do that. All I had to do was the talking. Of course, that was one of my worst things. Anyway, I showed the judge my birth certificate which proved I was 14. I wasn’t much past 14, but this wasn’t horseshoes; close didn’t matter. I told the judge I was living with the Jenks with my mother’s permission. The judge looked at her, and she started to speak, but then she looked at Mr. Jenks, and he smiled at her, and she realized she had given her approval for me to stay with them. She’d given it to Mrs. Jenks over the phone, and she was there to testify to that fact. I guessed my mother was wondering if she could lie about that. But, she’d told me when I’d phoned her in San Diego that she’d given me permission to live with them, so that was corroborating testimony, too. If she lied, I could testify, and Mrs. Jenks could testify and it would be two to one. The really important fact, however, was that I was indeed living with the Jenks right then, and my mother hadn’t contested that. That certainly supported the reasonable conjecture than she had given her permission. She could lie, but to me it seemed very unlikely the judge would rule in her favor. There was really nothing she could do but agree that she actually had given her permission. The third point was easy. I had $75,000 in the bank, in my name. My mother opened her eyes really wide when that fact was stated, and then supported with documentation. My expenses were larger than I imagined. All those clothes we’d bought, my allowance, my razor, everything was listed. However, there was also a statement saying they were paid for by the Jenks and there was also a notarized statement saying future expenses would also be paid for by them. Nothing was said about whether I was mature enough to handle my own finances. I guess they assumed, as all expenses were going to be paid, and as I got an allowance and had money in the bank, it wasn’t going to be a problem. It wasn’t likely it actually would be a problem in the near future, either, and if it ever was, it probably wouldn’t be until I was no longer a minor. As for my finances being from legal sources, Mr. Jenks spoke to that point. I sat back in my chair and hoped my part of this was done. Damn! I hadn’t really wanted to face her, to stand up to her, but she was making it necessary. I was supposed to stay seated, but this didn’t feel right to say sitting down, so I stood, and faced her. She slumped back into her chair. It was hard to look at her, but I did. I couldn’t help thinking back to growing up with her. Not everything had been bad. But while thinking of the good times, even then, I realized love hadn’t been much in evidence. Now, I had people who loved me, and that made all the difference. Seeing her defeated like she was, hurting with what I’d said to her, made me sad, made me realize our times together were over. Those memories, however, didn’t make me want to change my mind. And that was it. Mr. Jenks told me, driving home, that there were many legal entanglements that came with emancipation, but it was very unlikely I’d ever get snarled up in any of them. All I had to know about it was, until I went off to college, I’d be living with them. When we got home, after I’d hugged them and then hugged them again, Mr. Jenks went on, saying that if after college I didn’t still treat them like the parents they were going to be for the next few years, if I tried to go it alone without them, I’d better go back to being invisible again, because they’d come hunting for me, and they wouldn’t give up easily. If he hadn’t been tickling me when he said that, I might have been crying. I usually cried from being sad, but that time, it would have been from sheer and absolute happiness. The next week at school, everyone was talking about Mr. Johnson being fired. They hadn’t appointed a new vice-principal yet, or a new football coach, but as the football season was already over, there wasn’t any rush to do that. Dr. Jacoby was at the school every day, which was a change for us. We hadn’t seen much of him before this. Where Mr. Johnson had patrolled the halls, scowling at everyone and yelling and assigning detentions whenever he saw something he didn’t like, Dr. Jacoby smiled a lot, stopped and talked with kids and often left them laughing. What a difference he made! There seemed to be a lighter atmosphere in the school now. Everyone’s circumstances at school had changed for the better. I wasn’t being quite so introspective now, and nowhere near as reclusive, but I did think about that a little, about circumstances changing. About change, really. I’d changed a lot, as my circumstances had changed. Now I saw how the school was changing, too, and because of that, how much friendlier a lot of the kids seemed to be. Not everything changed. On Wednesday, Mrs. Bowerman got on my case. I’d used arcsecant in a problem where I should have used arctangent, and she started riding me about it, in front of everyone, making sarcastic comments about my intelligence. She did that to anyone who made a mistake, so it wasn’t anything personal, I didn’t think. It was just her being her. No one liked her much. But my mood was so much better these days, and I’d learned that standing up for myself usually had good consequences, so I let her blather on without losing the smile that had been a pretty constant companion of mine this week. She saw the smile, and she didn’t like it. Not at all. “Do you think this is funny, Keith?” She was glaring at me. I smiled even harder at her. She got red in the face, and opened her mouth to speak, but nothing came out, and she finally turned away from me and started talking to some other kid who’d made a dumber mistake than I had. So, I’d had a confrontation with an adult, hadn’t backed down, and won, with a smile! Yep, things were certainly changing. Except for Mrs. Bowerman herself. Nobody had liked her much before, and that hadn’t changed at all. Friday, I was excited all day. Darryl was coming for a sleepover! He’d be there for dinner, too. Then Gary was going on a date with Amy, a date he had high hopes for. I was just going to hang with Darryl at home. I had high hopes for my evening too, and figured, circumstances being what they were, that my chances were a whole lot better than Gary’s. After dinner, Mr. Jenks asked me if we could talk in private in his den for a few minutes. Gary was getting ready for his date. Mrs. Jenks asked Darryl to help her with the dishes. I sensed a conspiracy. Mr. Jenks and I went to his den, and he closed the door. We both sat down. He looked at me and raised his eyes in a way that make me know he wanted me to say something. “Uh, just what are you telling me here?” My heart had started racing. But, I noted, my stomach wasn’t tight at all. Since my mom had left, my stomach hadn’t bothered me once. Back in his normal voice, and with a smile growing broader as he spoke, he said, “I guess I’m telling you that Mrs. Jenks and I are going to make an early night of it. We’ll be going up to our room when the dishes are done. You know where our room is, don’t you? On the front side of the house?” He was really smiling hard now. There was no mistaking what that smile meant. My heart beat a little faster. He laughed. “Well, maybe something like this.” I tried to laugh, too, but it was hard, through my tears. It wasn’t much later than that when the two older Jenks said good night to Darryl and me. Mr. Jenks took his wife’s hand and they walked upstairs together. I looked at Darryl, and he looked at me. Then Gary came downstairs. He wasn’t dressed for a date. He was also scowling. If you enjoy this story, please let me know! Authors thrive by the feedback they receive from readers. It’s easy: just click on either email link you’ll find at the top and bottom of this page to send me a message. 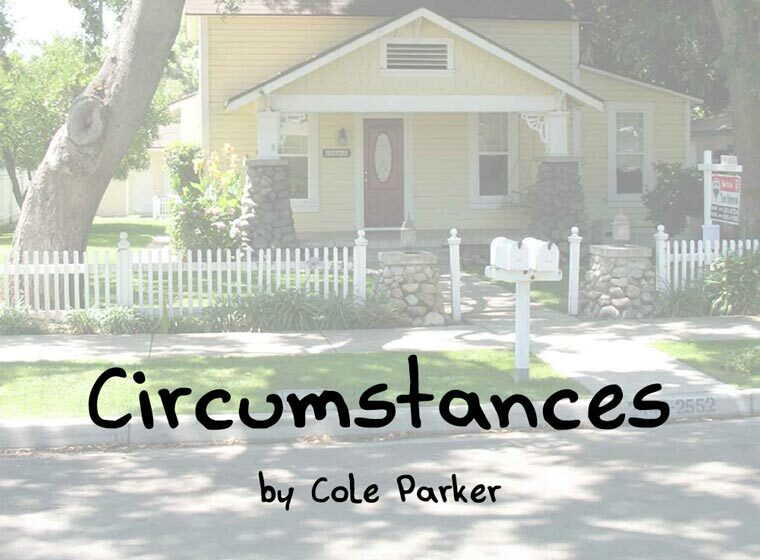 Say “Hi” and tell me what you think about ‘Circumstances’ — Thanks, Cole.